I recently saw a post on Facebook from a friend bemoaning the heat of summer. Did they actually forget the horribly long and cold winter we just suffered through in the Northeast? I for one welcome the bright hot sun of summer. Not only does it just make me feel great and want to wake up in the morning, but it is bringing us loads of great fruit and vegetables to the markets right now. Fruits, berries and cherries are lining up on the tables this month calling to us. The strawberries seem to almost be done, leaving cherries for their moment of glory. Now is the time to get them. Typically cherries are found in either pies, jams or fruit salads. So I decided to see what would happen if I made them into a savory dish. As with other stone fruits you want to look for an unblemished skin that is not overly soft or broken. The stems should look pretty fresh too. You can store them in the ‘fridge for several days in your crisper bin. (If they last that long!) Cherries have no cholesterol or fat and are high in potassium, vitamins A and C.
Cherries can be sour or sweet and within those broad categories you find several different varieties. 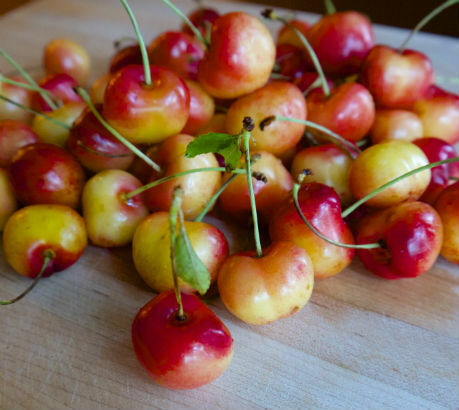 I decided to use the rainier cherry, a hybrid of two varieties that hails from the Northwest. The season for Rainier’s is upon us: typically mid-June to mid-July. 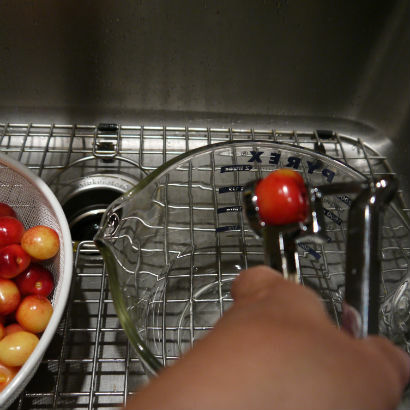 Pitting them can be an arduous task but with my handy cherry pitter I was done in a matter of minutes. 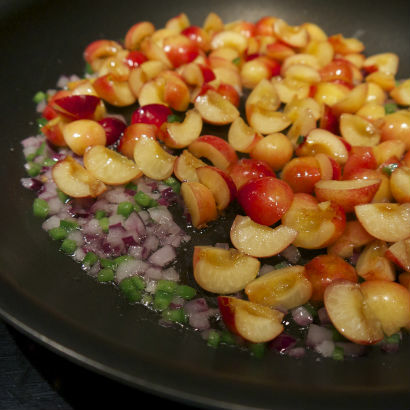 After a quick saute to soften the red onion and jalapeno I added my quartered cherries and softened them up too. Once off the heat I let it cool a little then added lime zest, juice and cilantro. 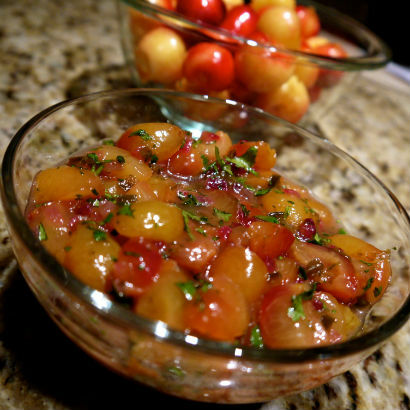 Click this link to see my recipe for: Rainier Cherry Salsa. 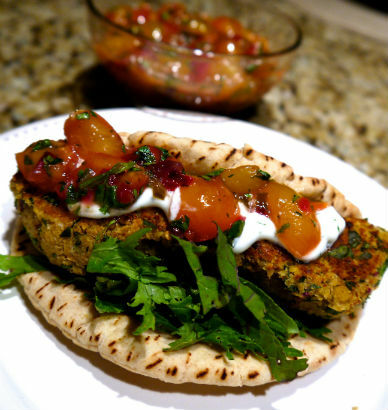 Her Falafel with a Twist recipe is just delicious and made in less than 15 minutes, using a food processor to help you along the way. 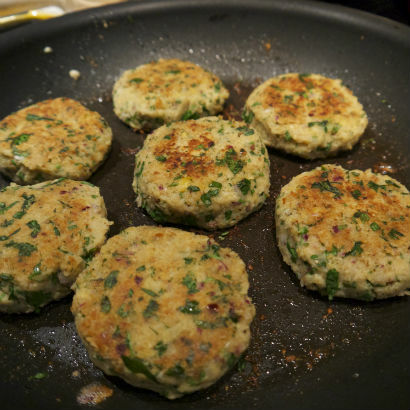 I topped the falafel with a little yogurt spread I made mixing a cup of Greek yogurt with the juice of a lime, some minced cilantro, salt and pepper. Altogether it was absolutely delicious with my cherry salsa! If you are out and about this weekend stop by the Down to Earth Larchmont Farmers Market. I will be demoing from 10:00-Noon. I’m going to have a sneak peak of something I found recently: baby fennel. I’ll have that recipe next week. Until then … Buon Appetito! 1. In a medium sauce pan, over medium heat, add the oil, onion, jalapeno and garlic. Season with a good pinch of salt and pepper and let it come to a sizzle. You want to soften it all up. 2. 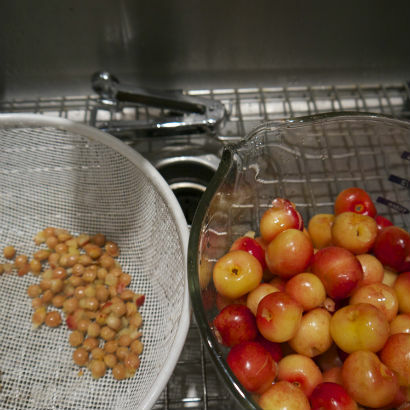 Add in the cherries and give it a little toss to mix it all together. Sprinkle over the sugar and let it cook for about 5 minutes, tossing occasionally. You want the cherries to soften up, but not brown. 3. Remove from heat and add the lime zest, juice and cilantro. Toss to combine and let it cool completely. 4. Store in an airtight container in the ‘fridge. Cook’s note: It’s best to use a very light a flavorless oil for this dish. I used avocado oil, easily found at Costco and Whole Food.